Put hazardous waste in its place. For many people, recycling is second nature. They either drop it off or it gets picked up at the curb. But what about those hard-to-recycle items, like hazardous chemicals? These have to be dropped off at a neighborhood collection event, but as you probably know, this can get complicated. The good news is almost every county in the Delaware Valley recycles hazardous waste. The bad news is not all programs are created equal. County recycling programs go by different names, some of them real mouthfuls, like improvement authority, solid waste authority, and municipal utilities authority. Some have fixed locations open every day, for the most part. Others jump from place to place, and they’re only open a day or two per year. Occasionally they will charge you to accept some items, but most do not. And some won’t accept certain items at all, like electronics, medications, and tires for example. Yet others do, but only on certain days. Simply use the links below to discover when and where you can drop off hazardous materials. Do it early and do it often, because you never know when floodwaters may wash them into a nearby waterway?with disastrous effects. Visit Earth911.com to see how you can recycle additional items your county does not collect. Visit this page to learn about oil recycling. Chemicals, electronics and medicine are piled together during the Christina River Watershed Cleanup in Wilmington, Delaware. 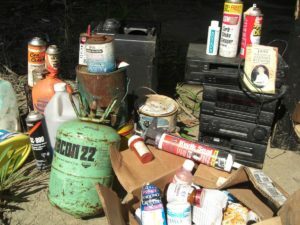 Dispose of these and other hazardous materials at a local collection event — before floods carry them to your local river.